The back-to-back UC Berkeley Baatcheet and Guftugu on contemporary art, held last month at the Berkeley Art Museum, was a great success! 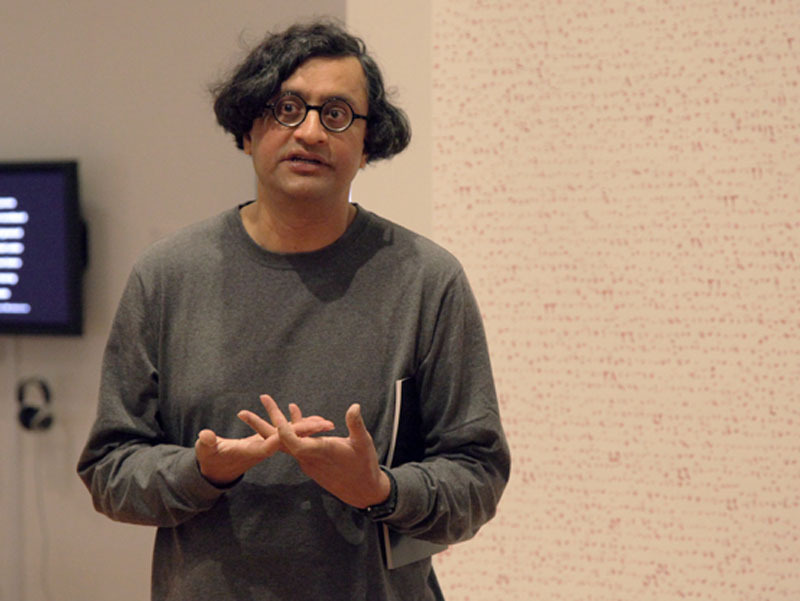 About 100 people showed up to participate in the conversations about South Asian art. The speakers were incredibly diverse. The program began with Professor Joanna Williams' insightful discussion of linear perspective in paintings from the Punjab Hills, followed by Anjali Joshi's presentation of Google's new museum mapping project. 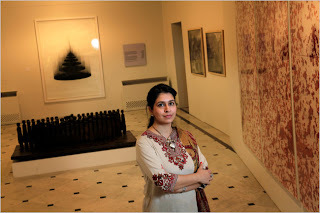 Collector Dipti Mathur shared her opinions on the work of contemporary artists working in India and Pakistan as well as in the South Asian diaspora, while Zahid Sardar offered an expansive view of the migration of walled gardens from the ancient Mid East to South Asia to California. Professor Robert Goldman concluded the Baatcheet presentations with a compelling talk on the visualization of the Ramayana text in various painted and printed forms. A question that arose for me over the course of the discussion was one of translation, specifically, about how we can think through the process of translation within the context of the visual arts. How do objects translate from one medium to another and affect ways of seeing, as in the case of Google's translation of 3D objects into a digital format for mass dissemination, or in the case of Pahari painters translating motifs of linear perspective that they picked up from Mughal artists? 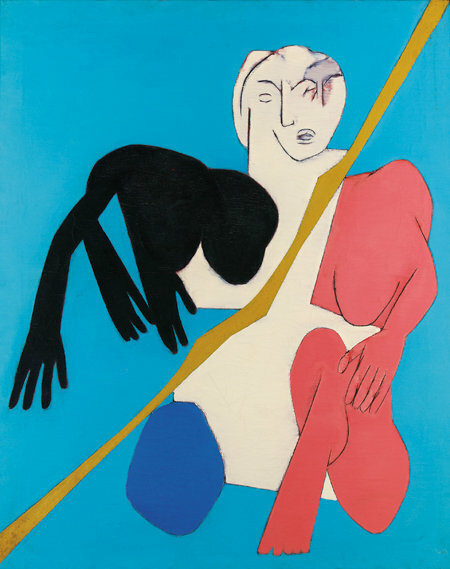 How do content, metaphors, and ideas translate into works of art, as in the case of contemporary Indian artists or in the case of the translation of the paradise (walled garden) form into various cultural contexts via trade and conquest? And finally, how do performance and textual traditions like that of the Ramayana translate into visual objects? What aspect of the translation is given precedence? What is missing and what might that tell us about how people valued certain narratives or characters in the story? The afternoon concluded with an excellent artist talk by Naiza Khan, and a lively discussion about the direction of contemporary Pakistani art. Don't miss the chance to see the excellent Roots in the Air, Branches Below exhibition on view at the San Jose Museum of Art until September 4th. The first Baacheet Around the Bay was held at SJMA on Thursday, March 3, 2011 to coincide with the museum's monthly Artrage event. With special guest DJ Samir, Bollywood-themed cocktails, and a live poetry reading, the SJMA Baatcheet created a perfect atmosphere for viewing the excellent works on display in the galleries. Stay tuned for the next Baatcheet, to be held at the Berkeley Art Museum on Sunday, October 16th from 2-5pm in Gallery B. The Berkeley Baatcheet will feature a number of speakers including art historian and scholar Professor Iftkar Dadi (Cornell University) and renowned contemporary artist from Pakistan Naiza Khan. Reception following event. Inspired by the Hindi word for conversation or chit chat, Baatcheet is a series of fast-paced, energetic, and collaborative conversations about South Asian art and visual culture. The South Asian Art Collective’s Baatcheet brings together scholars, curators, students, visual and performance artists, collectors, art enthusiasts, and members of the bay area community for a series of short, multi-media presentations each with the common goal of inciting dynamic, public conversations about art and culture of South Asia.